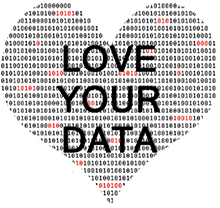 Join the conversation Feb. 8-12 during Love Your Data Week, which celebrates the open data movement. Emory University is one of 22 universities participating in this national social media event; Emory will also host in-person events throughout the week. Graduate students, researchers, librarians and data specialists are invited to join the conversation on Twitter (#LYD16, and tag @EmoryLibraries), share insights on Instagram or Facebook (#LYD16), and explore resources on the national campaign’s Pinterest board. Social media topic: Where do you store your data? Why did you choose those platforms, locations or devices? What are some practices that are good to follow, and what are some to avoid? In-person workshop: “Caring for Your Data,” 12-1 p.m., Room 314, Woodruff Library Level 3. Learn about your options to store and organize your data at Emory. Social media topic: Have a plan for organizing your data. This usually includes a folder structure and file naming scheme. Easier said than done, but you’ll find good tips here. In-person workshop: “Data Cleaning and Manipulation” (ECDS Advanced Applications series), 1-3 p.m., Room 314, Woodruff Library Level 3. Learn skills to improve the quality of your data and make it more usable. Social media topic: How do you document your data? Show us your lab notebook, protocols, procedures manuals, readme files. Tell us what you love (or hate) about how you keep research records. In-person workshop: “Intro to Database Design” (ECDS Advanced Applications series), 10 a.m.-12 p.m., Conference Room, Emory Center for Digital Scholarship, Woodruff Library Level 3. Learn the basics of the relational database model, why it is useful, and when you might need one. Social media topic: Distinguish yourself from other researchers with ORCID, a unique author ID. Learn about depositing data in a subject repository. Get a DOI for your data, so it’s easy for others to find. Open Data Information Fair, 11 a.m.-2 p.m., Rollins School of Public Health Café. Stop by the information table at the Rollins Café to learn more about making data open, and register for an ORCID (Open Researcher and Contributor ID) to establish your researcher identity. Social media topic: How can you make your data more reusable? What are the pros and cons of sharing your data openly? If sharing isn’t the norm in your field, what are the barriers? How might they be overcome? For more information, email Jennifer Doty, research data librarian.